The lightest ski in the well established 7 series from Rossignol is a departure from the wider full weight freeride skis in the range. The new Seek 7 is a genuine lightweight ski touring ski, at 2.55Kgs per pair, they are certainly light enough for the most gruelling days of ascent but Rossignol haven't skimped on the build quality. Featuring side wall construction for extra strength and performance these 87mm underfoot skis give fun, lively and reliable skiing in the whole range of snow types. The Seek 7 feature the same Air Tip 2 technology that can be found in all of the 7 series skis which reduces the swing weight and overall weight of the ski. They also feature the powder tip rocker shape found in the wider versions which helps make these 87mm wide skis much more fun in the soft stuff that the width would suggest. We found the Seek 7 to be surprisingly capable all over the mountain feeling agile yet secure on and off the piste. They are suitable as a one ski to do it all but with a touring focus. 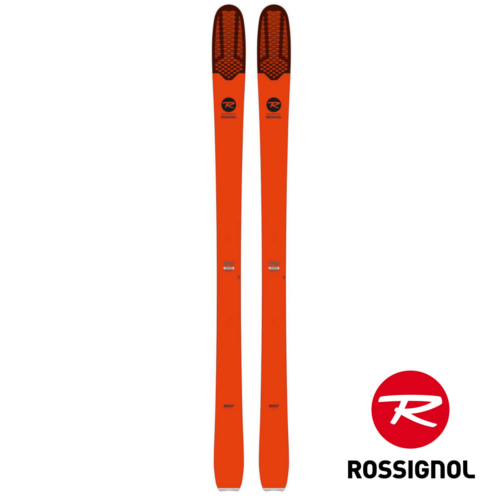 The Rossignol Seek 7 are a well priced and fun ski which is easy to handle, making them a great choice as a first ski touring ski.